Coach Scott Frost announced on Friday that three walk-ons have been placed on scholarship: senior wide receiver Bryan Reimers, junior linebacker Jacob Weinmaster and junior running back Wyatt Mazour. Mutliple departures from the team left the Huskers short of the 85-man scholarship limit. "Those three guys kind of epitomize the walk-on program to me," Frost said. "They came in here, they sacrificed, particularly Jacob who's paying out-of-state tuition to be here. All three of them have earned spots on special teams which is usually your first start getting on the field is to contribute on special teams and all three of those guys have been selling out to be some of those guys and work their way up the depth chart. Those guys come to work every day; there's hardly anybody on the team that works harder than those guys and we're happy to have them on the team." The players learned the news late in practice on Friday. "It was in the last period of practice and I had come off the field from my rep and he just called me over quick and just told me, 'Hey, I'm going to announce it,'" Reimers said. "That's how it went." Reimers, a 6-foot-5, 220-pound senior from Lincoln East, was also placed on scholarship in January of 2017. He's caught seven passes for 100 yards and two touchdowns in 22 games with three starts over the past two seasons. Reimers said it was a little difficult to stay focused the rest of practice. "Luckily, we had only about five minutes left of practice so I only had a few more reps left," Reimers said. "My mind was just racing those last few reps, but it was such a good feeling and to see the support from my teammates when he announced it was just awesome to see." Weinmaster is a 6-foot, 220-pound 'backer from Loveland, Colorado. He earned Scout Team Special Teams MVP while redshirting in 2015 before missing 2016 with an injury. He played in every game last season, contributing significantly on special teams and also filling in at outside linebacker when injuries struck at the position. He recorded two tackles last season, both against Purdue. 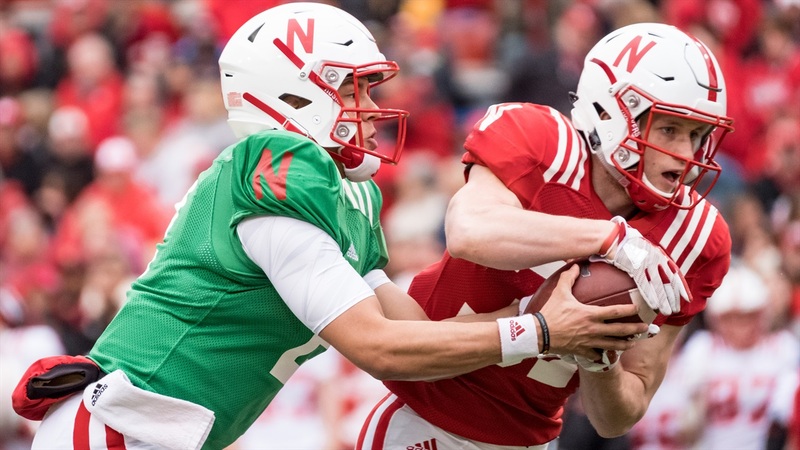 Weinmaster is working at inside linebacker for Barrett Ruud, one of the shallowest positions on the team following the departures of Andrew Ward, Willie Hampton and Avery Roberts. Mazour, a 5-foot-9, 200-pound back from Boone Central, has played in four games over the past two seasons including three on special teams last season, and he was a part of the travel roster for all four Big Ten games. Injuries have held Mazour back throughout his career including during fall camp but running backs Coach Ryan Held said on Wednesday that he's one of two players getting the primary snaps at the Duck-R position. "It's fun to see the team get excited for their brothers; that's the best part," Frost said about awarding the scholarships. "When you announce it and the team goes crazy and gets excited for something good happening for one of their teammates, that's what makes it special. The team was elated when they heard all three names." Reimers backed up what Frost said when asked about the other two. "Super happy for those guys," Reimers said. "Those guys are such hard workers too and they deserve every bit of it. They come every day. Those are some of my best friends. They're two walk-ons and they definitely deserve it and I'm proud of them." What the first order of business for a former walk-on after practice? A phone call home. "I think I'll probably give my dad a call right when I get in the locker room and see if my mom is available," Reimers said. "Just tell my parents and family, and then the word will get out sooner or later. Just thankful."